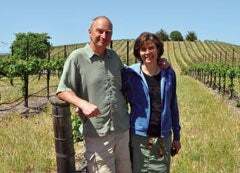 As owners of Castoro Cellars, one of the oldest wineries in the Paso Robles region, the husband and wife team of Niels and Bimmer Udsen say they took a backward approach to developing a brand. They began making wine in the early 1980s and over the course of the next ten years, bought equipment and opened a tasting room. The winery site was purchased in 1991, and within the past decade existing vineyards were purchased and new vineyards planted. Today, over 100 of the 700 acres farmed by Castoro Cellars are grown organically. The winery was officially certified by California Certified Organic Farmers (CCOF) in 2007. In addition, the winery's sustainable farming techniques have earned a Sustainability in Practice (SIP) Vineyard certification. This distinction acknowledges Castoro Cellars' commitment to environmental stewardship, fair treatment of employees, and economic viability. SIP Vineyard certification was established by the Central Coast Vineyard Team to identify sustainably farmed wines to customers. The Udsens say they named the winery Castoro Cellars after the Italian translation of Niels' life-long nickname, "Beaver," prompting the motto "Dam Fine Wine." From the wine cellar to the tasting room, all who contribute to Castoro wines hold strongly to the belief that high quality wines should be accessible to consumers. "We feel wine is an essential part of the daily meal," says Niels. "We provide consumers with outstanding wines that will allow them a fine bottle with any meal." The past 30-plus years have seen Castoro grow from producing a few barrels of wine in a rented corner of someone else's winery to developing a custom-crush operation and a 60,000-case winery. The winemaking team, including Niels, veteran Winemaker Tom Myers, and Assistant Winemaker Mikel Olsten, has worked together for over two decades. In 2007, Enologist Sherrie Holzer joined the team. Maintaining quality while increasing production can be a challenging task for small wineries. However, Castoro Cellars has managed to expand production without sacrificing quality. "The size of the winery relative to our brand has allowed us to have built-in growth capability without compromise. This situation is still in place," adds Niels. Today, the winery is growing more and more of its own grapes. 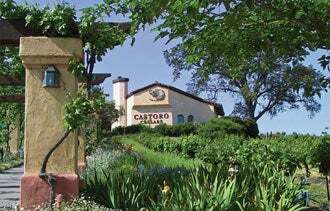 The name Castoro Cellars is now associated with a long list of premium wines, with a specival focus on their Paso Robles Zinfandel and Cabernet Sauvignon. Niels and Bimmer consider their Zinfusion,Whale Rock, and Cobble Creek Zinfandels to be their flagship wines. Castoro Cellars' winery and tasting room are located in two separate and distinct settings. The winery is to be found "off the beaten path" and provides the space desired for Castoro's production facilities. The tasting room, conveniently situated just off Highway 46 West, is a shopper's delight. It's full of gifts and curiosities for wine lovers. Plus, guests are delighted to have the opportunity to taste the wines from Castoro Cellars' distinguished portfolio. The tasting room staff has worked at Castoro Cellars for many years and has garnered a reputation for its incredible hospitality. They invite their Paso neighbors and anyone passing through Paso Robles to come to the tasting room, raise a glass, and toast the good fortune and success of the region and to enjoy its wines.